When I first arrived for the 2014 edition of the Jesse Litsch and Bechtel Financial Celebrity Golf Tournament it was a Winnie-the-Pooh kind of blustery day. 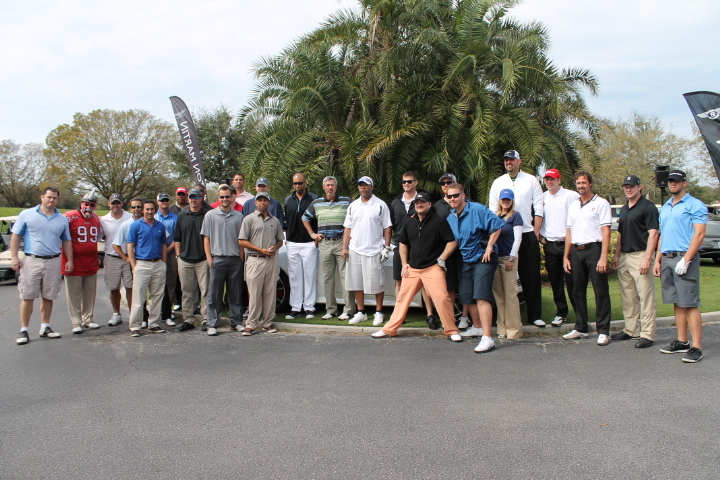 But a great thing happened just as the teams assembled for lunch before 18 holes of great golf. The skies parted and that warming Sun took charge of the event. But I also want to believe someone up there wanted Connor to have a perfect day. I got to meet Connor a few years ago while he was struggling with that nasty “C” word. The kid was spunky, friendly and determined to fight this cancer back into submission. I heard from a smiling bird a week prior to the event some fantastic news about Connor, and I was beaming the rest of the day. 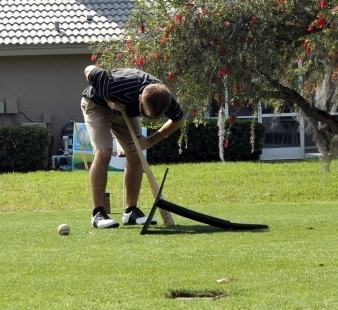 So it really was perfect the Sun was blazing and the celebrities all assembled in a half-moon around a make-shift Home Plate as Litsch lobbed a mid-zone pitch in and Connor rocked it high into the left-side section of the field up onto the Putting Green. You see today was a day Connor could celebrate, and all the assembled celebrities wanted to also give him a special and emotional celebration. You see Connor has fought the demon and won. He is now Cancer-free. As he rounded the bases to cheers from everyone around the circle the celebrities gave him a Home Plate “team meeting” as they all rubbed his head, shook hands and clapped to celebrate this awesome achievement by one truly courageous young guy. I will admit, there was some liquid on my cheek, but I told people it was dew from the palm tree. I was even more honored to photograph the moment and hope everyone remembers Connor fight and to remember Jimmy V’s words, “Never Give Up”. 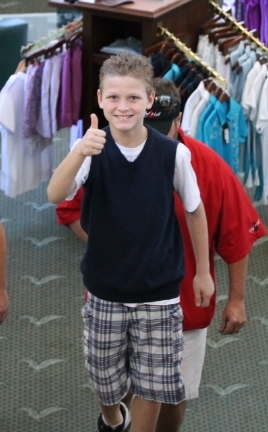 Connors own charity “Friends of Connor” which supports other children taking on cancer is only 1 of the trifecta of great charities that the golf tournament embraces closely. The North Pinellas YMCA Summer Camps and Bechtel’s Bikes for Kids, which provide bikes and protective gear for children in need around this region and are delivered each holiday season by Pinellas County Sheriff’s department. 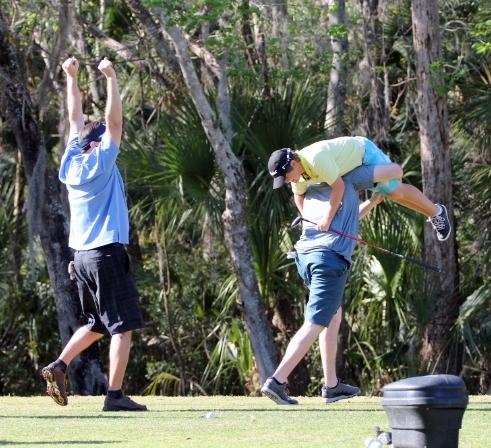 After the emotional beginning of the day events the assembled duffers made their way around the beautiful and wildlife-filled EastLake Woodlands North course to take on events like the Long Drive, Closest to the Pin and the always welcome Red Bull 9th hole. This year some amazing food also graced the greens as Skyline Chili (Chili Dogs), Johnny Grits( amazing Shrimp & Grits) and Jersey Mikes (Cheesesteaks) helped keep the golfer full, happy and never hungry. But of course everyone was either dreading or loving the all-time favorite holes, the tee-ball blast or the Kick, Punt and Pass competition. Every year there are highs and lows at the T-ball hole as some people give it their all and the tee takes the blunt, or some bunt while others like Toronto Blue Jays RP Sergio Santos gets some pre-Spring hacks in advance of Inter-League fun. I swear the tournament should post up a photographer at this hole with photos of all the participants and hold the pictures as a charity ransom so they do not get popped over the social media channels. Okay, maybe that is just my sinister idea. But seriously, the Kick ,Punt &Pass hole is by far the measure of who still has it and who…doesn’t. I know a few people dread this hole, but the two pairing I witnessed participate this year did a great job with only 1 shanked punt. You see they first have to kick off a tee, then someone has to punt the ball, finally someone has to bring out their inner-Flute and throw as far as possible and the pairing then set their balls down and go from that mark. Always one of my favorite stopping points as I walk the 18 holes and try and catch people off-guard (in a good way). 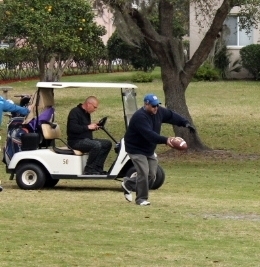 Absent from the tournament field today were the Rays contingency who had their Pitchers and Catchers report on the tournament’s date, but the event did have a Rays flair as former players Andy Sonnanstine, Dan Wheeler, Fred McGriff and Coach Ozzie Timmons made their ways around the course. There were also over 2 dozen members of the Toronto Blue Jays farm system from top prospect Aaron Sanchez to MLB showing support for the event. Again the evening was not only highlighted by the always amazing Silent Auction, but by the antic and jovial personality of local television icon Charlie Belcher. He was out there along with his wife visiting the various greens chatting with the golfers and providing liquid refreshments. I can honestly say he is one of the best MC’s in this area and is always fun to watch as he presents awards during the evening’s final moments. From start to finish I always enjoy the event as each gear from George’s precision from start to finish, to Jesse & Kevin Bechtel’s involvement on the course and beyond to the conversation and sights I get to witness each year. It was another Home Run of an event and it all started with a walk-off Grand Slam by a kid wearing that great Toronto Blue Jays cap. Connor may have stolen the show this year, but Litsch and Bechtel and eager to go to bat for each charity for the next 364 days. If you want to participate in a future tournament, donate or just keep abreast of the tournament’s events. You can visit the tournament website here, or follow them on Twitter. 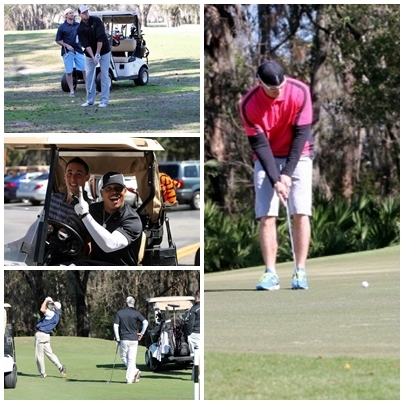 Here is a link for additional photos I took at this year’s Jesse Litsch & Bechtel Financial Celebrity Golf Tournament. I have mad respect and admiration for Jesse Litsch and Kevin Bechtel. It takes a special breed of person to give back year after year and make an event like their annual Jesse Litsch & Bechtel Financial Celebrity Golf Tournament grow larger and more respected every single year. And Litsch was a pure trooper this year just 4 weeks removed from surgery on his pitching shoulder and was there with energy to spare all day long bringing another huge positive vibe to the event. We all know this day of charity and great experiences is not just about the fun events like the Punt, Kick and Pass hole, or even hitting the ball off a tee for yardage, it is the bonding atmosphere and budding friendship vibe that encompasses this tournament from beginning to it’s final yearly conclusion that keeps people coming back, and telling their friends to also come experience the awesome event. I do not know who or what sat Bechtel and Litsch together at that 2008 golf tourney awards dinner, but whatever it was, I can assure it has to have a grin from ear-to-ear because of their successes and forward motion to helping kids in the Northern reaches of Pinellas county and beyond. I have been a part of this grand day for the past 3 years and have personally seen it grow into the “Must Do” event that precedes the reporting dates for most of the MLB teams that migrate to this region in mid-February. 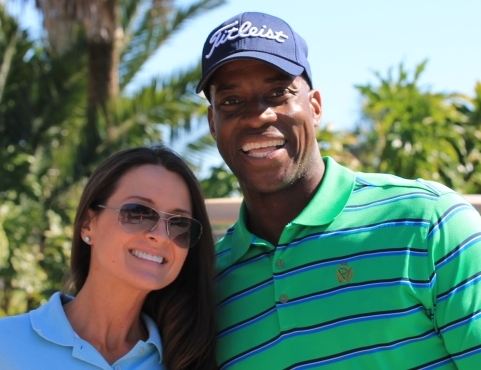 It is this duo’s shared passion and want to give back to their respective communities with a vengeance that has me eager and excited to come North to East Lake Woodlands Golf Course and spend a day with Jesse, Kevin and over a hundred of their golf celebrities and friends who also have charitable hearts. 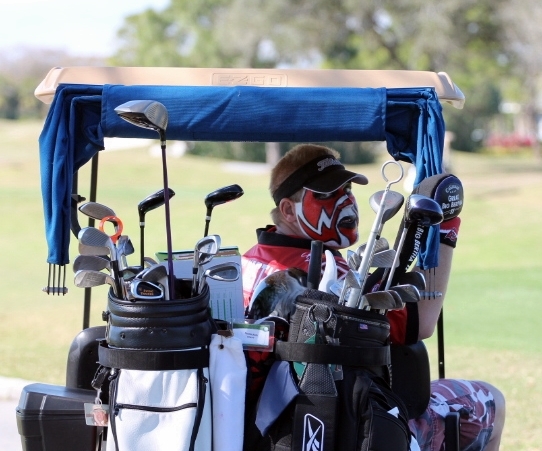 As the tournament has aged, so has their outreach to other needy organizations within this area. Litsch first got to see a portion of Bechtel’s dream when he attended the 2008 “Bechtel’s Bike for Kids” program during the holidays when bikes and helmets were donated by Bechtel and then were loaded up by Pinellas County Sheriff’s Deputies and distributed around the area. 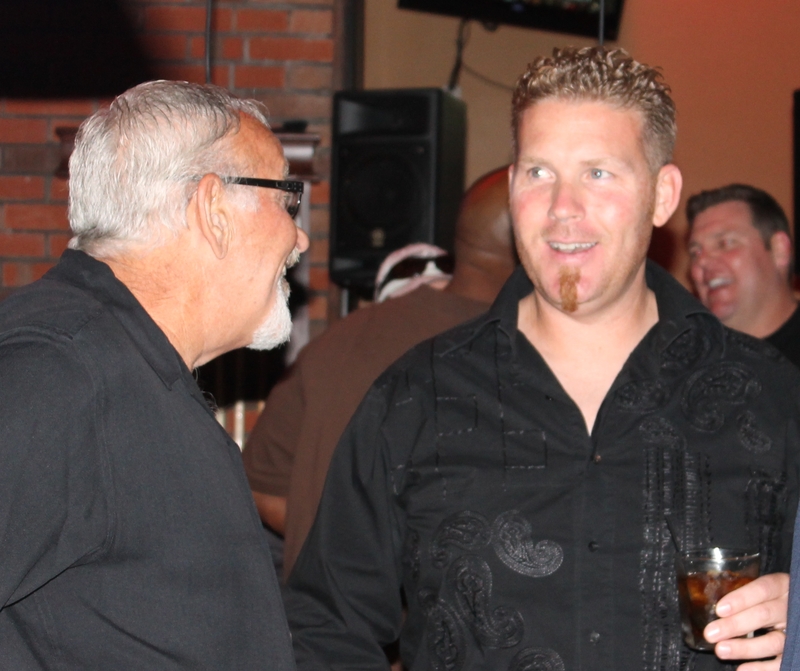 On that faithful night, the seed was planted that spawned this very event and the continuous expansion of focus towards helping more charitable kids programs. After the success of 2012, the pair began helping the North Pinellas YMCA Summer Camp and have expanded their “Friends of Conner” involvement which benefits and helps children who are fighting cancer. onner was there again this year and stayed only for part of the day since he had baseball practice at 3pm, but that reason in itself shows Conner is beating the big “C” and is living his life to the fullest. 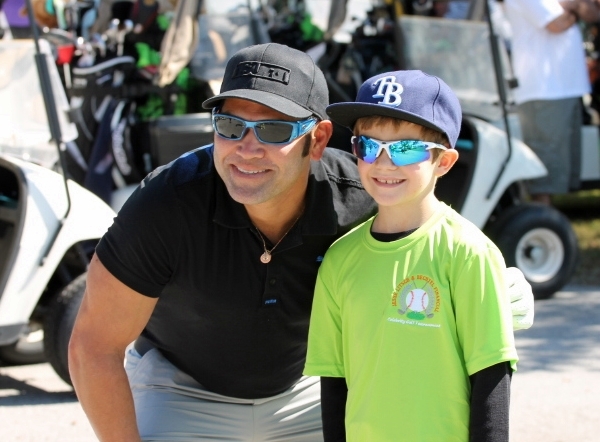 It was special seeing Conner this year get a photo with all around good guy Johnny Damon before the event started, and the pair talked for a bit and I think Conner inspired Johnny a bit that day (He later drained a 30-ft put on Hole 10). 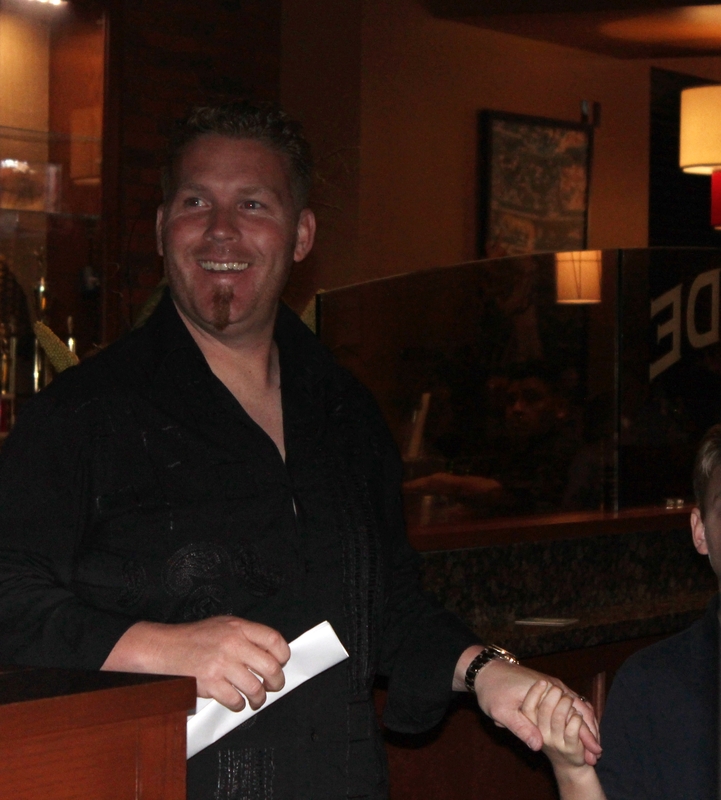 At this year’s event we all got to meet another new “friend”, Dimitri or better known to all of us now as “D-Money”. Here is another crusader who is taking the fight to cancer, winning and showing all of us some amazing golf skills not only for someone of his age, but to the thrill of all of us young and old. I watched in awe at Hole 9 as “D-Money” hit that ball almost on a string straight to the pin, only missing it by inches or getting a odd roll. 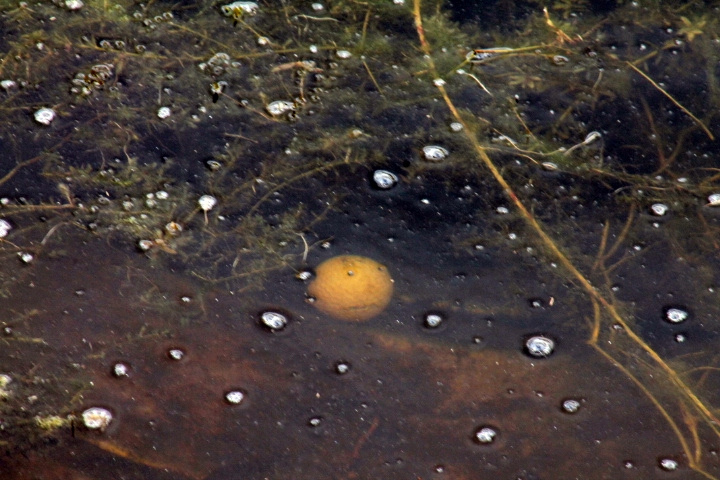 More than once during the day Dimitri put his golf ball as close as anyone could, even a professional. If he keeps that up, “D-Money” will definitely get a shot to shoot the ball off a tee at Pebble Beach. And it is great to see so many of these stellar athletes both young and retired mesh together with their parings and form memories and stories that will be told for years and years thanks to Litsch and Bechtel’s vision. I again walked the entire course and got nothing by waves and smiles from the pairings as they teed off, set up their putts or took a few moment to relax at the Red Bull “Oasis” at Hole 10. 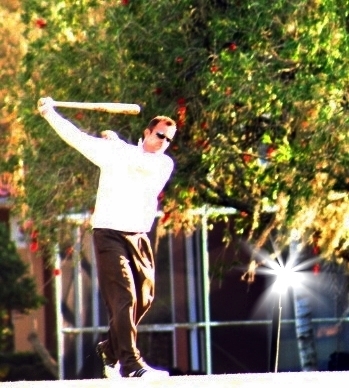 Mixing the grand game of golf with a small slice of athletic challenges bring a unique energy to this event. Sure there is still the usual “Closest to the Pin”, and “Longest Drive” competitions, but the skills sometimes brings the celebrities and amateurs together bonding in both laughter and amazement. But for me the best time of the event is the roll towards the end of the day. As dinner approaches the volume and capacity of the dining area grows with tales of the day. 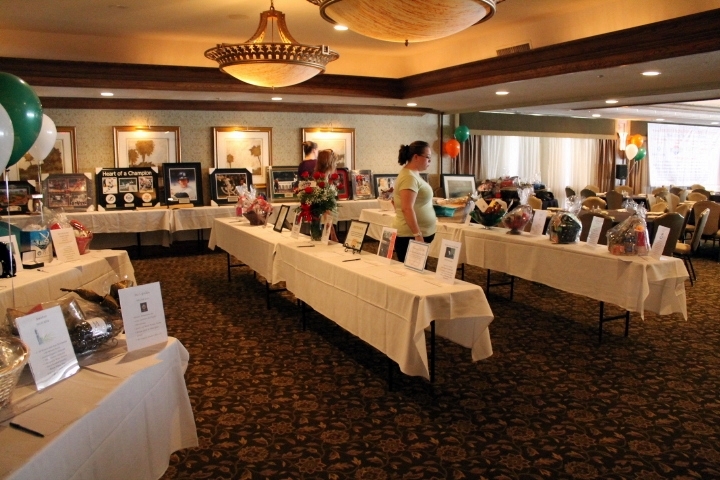 People gather who might not usual know each other as converse about the event, the silent auction items and even about a few celebrities at the next table or next to them in line at the buffet table. As the evening comes to a close awards are given out, people take a last chance at their auction wants, and new friendships and memories are sealed into us forever thanks to this event. I can not thank George, Jesse, Kevin and Debbie enough for their hospitality over the last few years as I also got indoctrinated to this event and finding myself each January now saving the date for another round of fun and charity to support this organizations charities and objectives. If you want a day of fun you will remember for a long, long time. 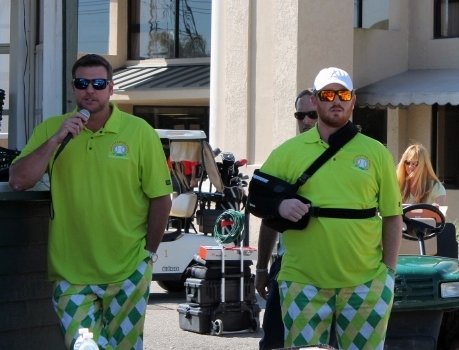 Want to help children in the Northern reaches of Pinellas county and beyond, then you have to be a part of the 5th Annual Jesse Litsch & Bechtel Financial Celebrity Golf Tournament. But be warned, this event is addictive because once you have gotten a glimpse and taste of all the great times and experiences, you will be back again the next year knowing the golf again will be fantastic, the food delicious and the company on and off the course above par. 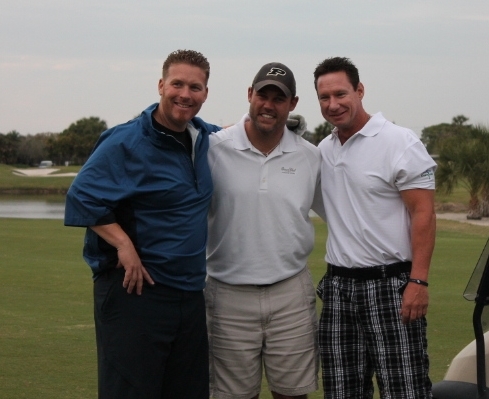 Hope to see you at the 2014 Jesse Litsch & Bechtel Financial Celebrity Golf Tournament. Here is a Flickr Link to a photo set of all the pictures taken during the 2012 Jesse Litsch & Bechtel Financial Celebrity Golf Tournament. All photos are public and can be saved to your computer if you want to print them. I never make my photos private so the great events moments can be shared by anyone and everyone. I do not remember the first time I went out to the Tyrone area of St. Petersburg, Florida and watched my first Miracle League ballgame. Here were kids, some with huge physical disadvantages with smiles going from ear-to-ear laughing, along with their adult co-pilots whistling around a soft surfaced baseball diamond with the ease and grace of deer or birds. I tugs deep inside you to see the joy, adulation and huge amounts of spirit on display not only by the cheering parents and friends, but by other kids awaiting their own turn at the plate. The Miracle League was the first charity ex-Tampa Bay Rays catcher Toby Hall took under his wing when he began his foundation. As the league as grown, so has Hall’s involvement with another great institution, Buddy Baseball who now joins side-by-side with The Miracle League as Hall’s main baseball charitable interests. Both of these leagues embrace the positive things about the game of baseball as well as promote equality as players no matter your limitations and bring about a honest and positive experience for all involved. And this is something Hall has not only embraced during his playing days, but also kept the spirit alive and thriving since his retirement from baseball last season. His foundation and his annual Toby Hall Spring Training Celebrity Golf Tournament have grown just as much as his charities, and the involvement of present and past athletes from the Tampa Bay are and beyond have stepped to the plate and knocked balls clear past the fences with their charitable donations and efforts. 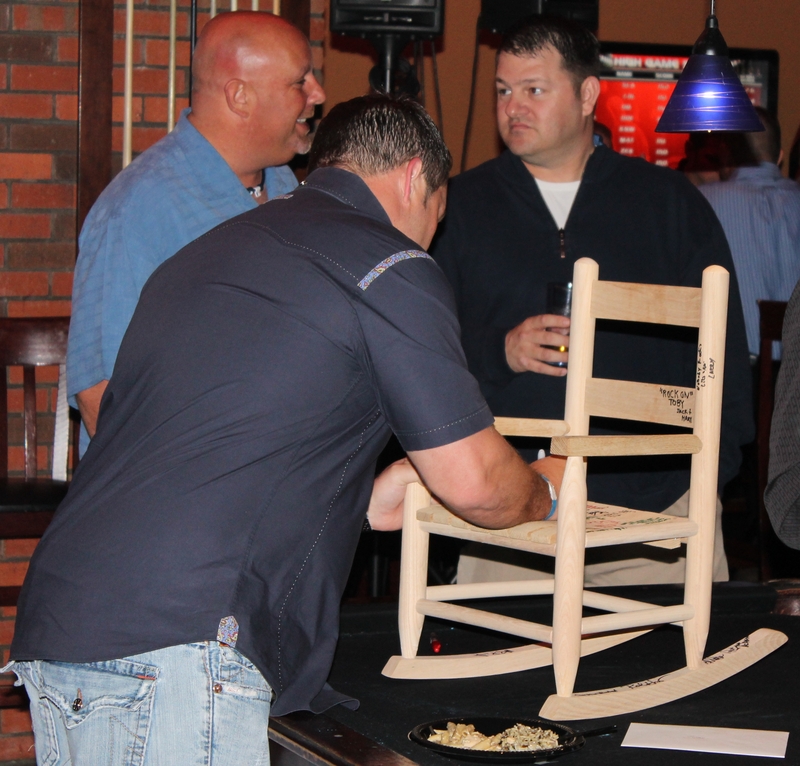 From his golf day events and raffles, to that evening much anticipated silent auction, I have been glad to watch as this event has grown into an event that people mark on their calendars as far back as October to be a part of this event. This season I got a grand honor of being the celebrity greeter at the event and got to meet plenty of people I have never met personally as well as greet old baseball friends and past participants who remember my face. 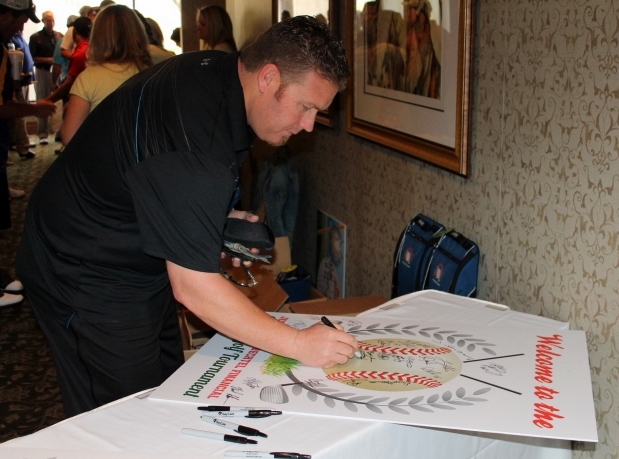 And this event is not only for baseball players. The assorted collection of athletes and celebrities from this region that show support for this event runs a gambit from artists like TW Curtis, Hooters/ Sports radio icon Lynne Austin, Rays “strapping young Rays lad Todd Kalas, and even Fisher from 97X radio grace the celebrity pairings as well as guys who made their name on the fields, ice and gridirons. 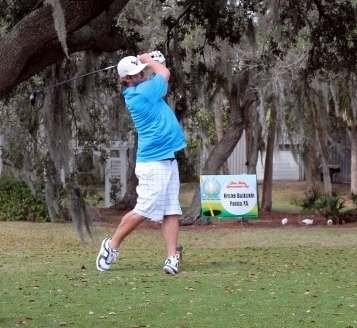 From the frozen ice we saw former Tampa Bay Lightning goalie, Pat Jablonski putting a few dimpled balls into the cup. Boxing champion Winky Wright took a few doglegs left and right this year as well as Montgomery Biscuits Coach Ozzie Timmons and his memorable pants. 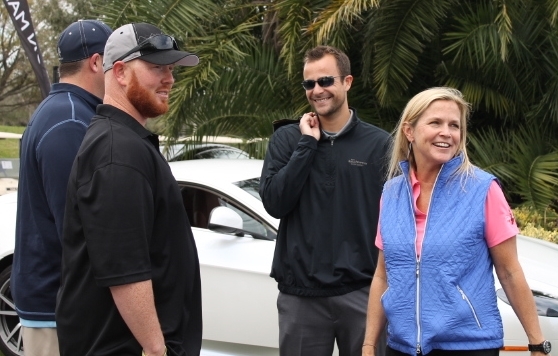 Even LPGA golfer Brittany Lincicome and Lantana Stone made celebrity appearances this year. Buried in the list of celebrities was also a race car driver, Martin Plowman. 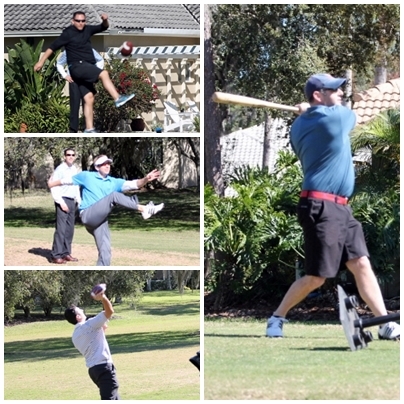 In all, athletes from ex-Bucs great Mike Alstott to Wright made their yearly pilgrimage to Hall’s event, and as always, fun was in the air and the kid’s were on our minds. The day was prefect for golf. Not to hot, not to cold (until the later hours) and just enough wind to drive the golfers crazy with slices and hooks, but also keep the sweat off your neck and arms to prevent a little too much Sun. Even special treats like amazing Bloody Marys via an icy adventure, to succulent and tangy shrimp cakes with an amazing sauce kept spirits high and fun at an explosive level. It was great seeing old Rays baseball friends like Dan Wheeler, Trever Miller, Andy Sonnanstine, Jason Romano, Randy Winn and the “Crime Dog” Fred McGriff take time out of their schedules for such a great cause. 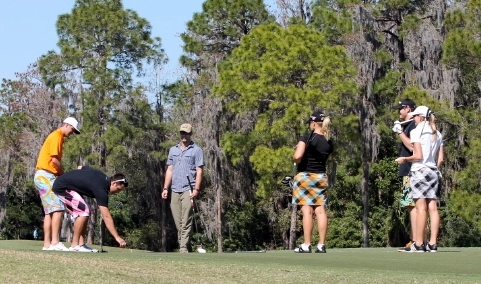 Other current MLB players like Adam Lind, Jesse Litsch and AJ Pierzenski (who brought his own foursome) along with the Rays rotation duo of Alex Cobb and Matt Moore showed their support for Hall’s charities as well as play a pretty competitive and good spirited round of golf. 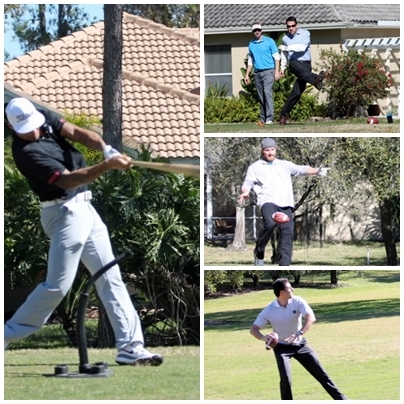 And the Tampa Bay Bucs were not absent from the festivities as former players like Alstott, Dave Moore, Anthony Becht and Reidel Anthony played along side current Bucs WR Vincent Jackson during the scramble tournament. As always, the day began with everyone relaxing, eating some lunch and getting themselves ready for a great day for golf and supporting Hall’s many charitable organizations. From mulligans purchases to the final bids of the evening at the banquet with our new comedic friend “hook ’em horns” guy, the event came to a final end with some of the kids and parents of both charities in attendance at the nightly banquet/silent auction. I even got into the spirit this season bidding on a great autographed item and being able to take it home and proudly put it on my wall as a reminder of this great event and the guy who brings joy to so many kids within The Miracle League and Buddy Baseball. So, I need the date for next year because I definitely want to highlight it and save it because who would not want to be a part of this foundation’s great events and shake hands with the humble host who always seems to get that clutch donation. I have always had mad respect for Hall, but this season I think I can ratchet it up a few more hundred notches. 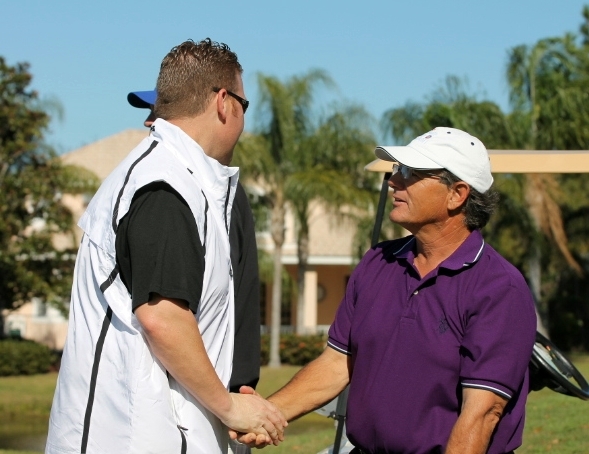 Always a pleasure helping Toby out with this event, and I’m not only looking forward to the 2014 Toby Hall Spring Training Celebrity Golf Tournament, but 3-4 years into the future as it is so much fun to volunteer and be a part of such a great event hosted by such a humble and great supporter of the game of baseball. Call me anytime Toby, I’ll help in anyway possible. 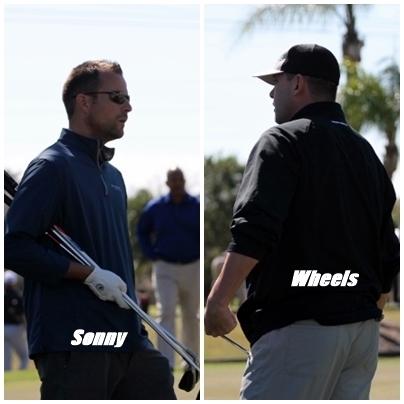 Here is a Flickr link to all 81 photos taken during the 2013 Toby Hall Spring Training Celebrity Golf Tournament. I truly believe it is an event like no other in Tampa Bay. 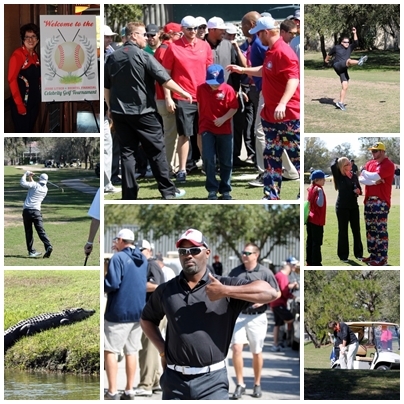 From the evident bonds between teammates and the golf participants this golf tournament is more than just 8 hours of fun, sun and conversation, it is truly life changing. When I first volunteered for the Jesse Litsch & Bechtel Financial Celebrity Golf Tournament last season, I spent a majority of my time cooped up in the clubhouse not getting the full jest and personality of this awesome tournament, but in 2012, I decided to do things a bit differently. Maybe it was the inspiration I got from seeing young Connor sprinting and being a kid around the golf course before the guys even hit the links that inspired me. Here was a kid who was battling that demon, the big “C” who was cheerful, spunky and all around a young guy you wanted see beat not only this aliment, but anything in his wake. 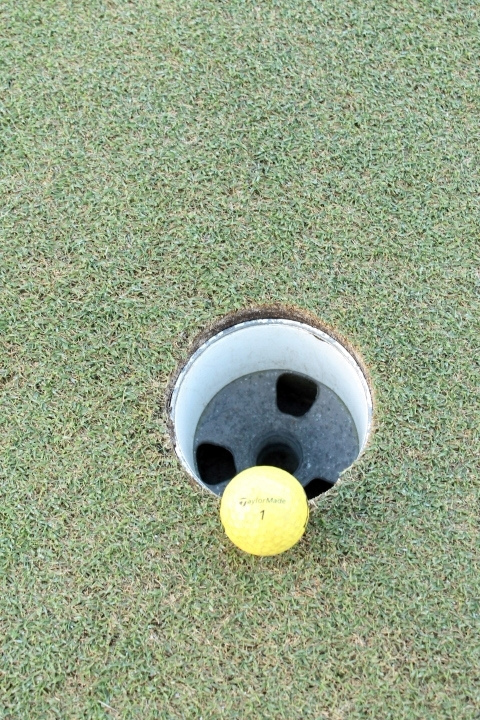 It got me pumped up, and with that I walked all 18 holes of the East Lake North Golf course on this day. Connor was one of the tournament’s charitable recipients this season, and I could not think of a better way to not only honor his courage and smile while facing such an ordeal than to give a pound of sweat and maybe a few aches and pains getting photos I left behind in 2011. This is an organization that brings together not only the young and veteran members of the Toronto Blue Jays organization, but other professional players from the Tampa Bay region, even a few Tampa Bay Rays. I talked to Rays SS Reid Brignac earlier in the week and he was upset he would miss this tournament because of a prior commitment. But those assembled for this great event that not only will help Connor, but will also give funding to programs like The Boys & Girls Club and The Bike for Kids program which is a charity in conjunction with the Pinellas County Sheriff’s Department to give bikes to underprivileged children during the holiday season. And all this started when Litsch and Bechtel first talked during a similar golfing event back in November 2008. They say sometimes the best things happen on the golf links, and with regards to this tournament, that is exactly how it unfolded. 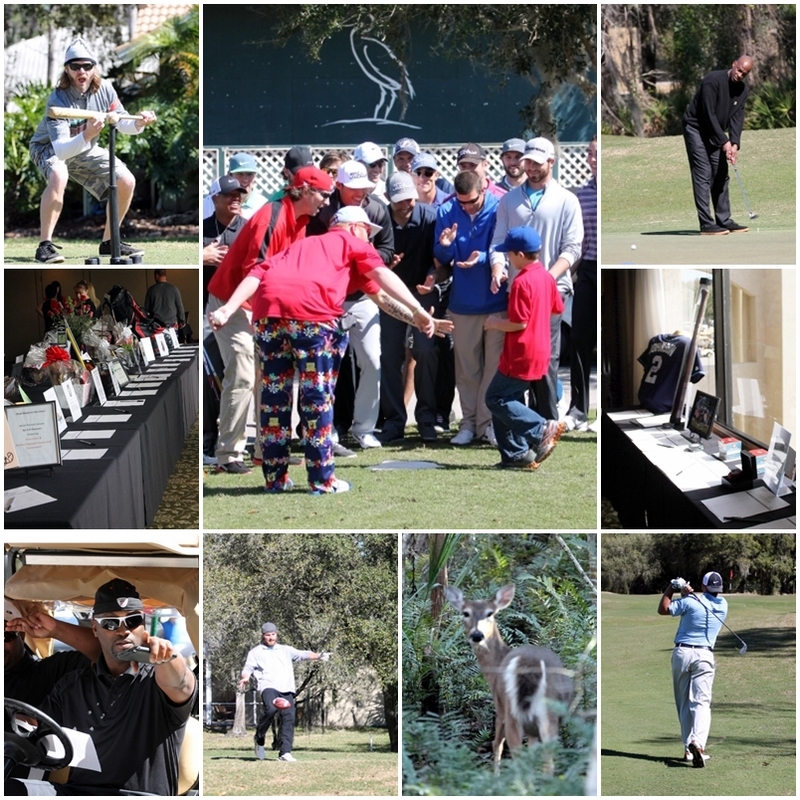 In its third year, this event has not only grown in the silent auction arena providing countless great adventures and signed memorabilia, it brings together people from all walks of life and bonds them into a common goal and objective to have fun for the day while bringing in financial help for the tournament’s charities. But this is not your father’s usual golf tournament. 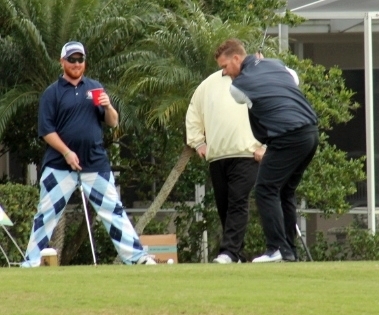 Sure you have the shotgun start, the usual wild pants, hats and decorative ensembles that go together with such events, but the pairings of celebrity and amateur golfers brings a conversation, and common interest and maybe even a possible kinship that could spawn another tournament just like this one. 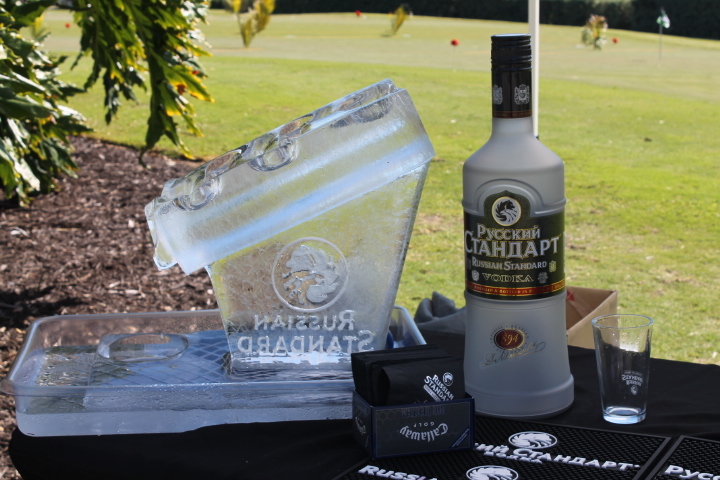 I have got to say as I cruised the golf course from the 18th hole to the first tee in reverse, I wanted to get the vibe and energy that makes this event unique and a “must attend” event each Spring. Got to admit, I got that in spades, but it wasn’t enough to win the card game on that one particular tee. But this event which is focused firmly on its charitable funding also doesn’t take itself too serious not to have some fun during the day, even with events straight out of what must have been a Pledge Captains’ fraternity play book. 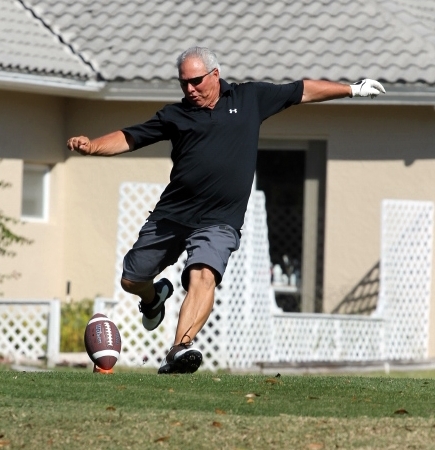 I mean you had kick, punt and pass holes for additional yardage that most though former Bucs kicker Martin Gramattica would own. That hole by itself was worth the mileage walking this golf course as both young and old tried to bring back a bit of past glory, but few seemed eager and willing to re-visit that piece of time. Still, it was a hole where also laughter ruled the day and even a few comments vented towards participants whose past football glory let them down on this day, shanked to the left or right of the fairway. Remember I spoke of the Frat angle, that is the 10th hole. A huge Red Bull tent where Litsch camped out for the day along with a killer sound system, very spirited ladies providing beverages and even photos along with a long drive contest that proved to be not only water challenged, but hair-raising at the same time. 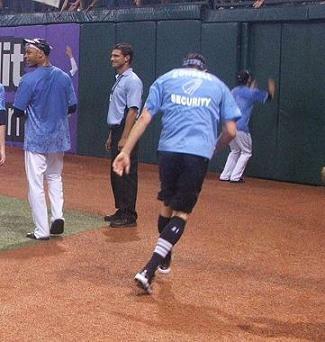 Of course I also got a ball jettisoned my direction by recently retire Rays C Toby Hall, but the ball ended up high, wide and not very handsome, hopefully missing someone in their backyard. Still, this half-way point of the course had the vibe and energy of the entire event and it kept me not only going, but provided me with a chance to sit and chat with many of the day’s duffers, including former Rays P Doug Waechter. But my favorite hole by far was the baseball tee. I know there were more former or current baseball participants in this assembled logjam of golfers than any other sport, but moist of us never had to hit a ball off a tee, and much less with 4 other people behind us critiquing use like the MLB Network. 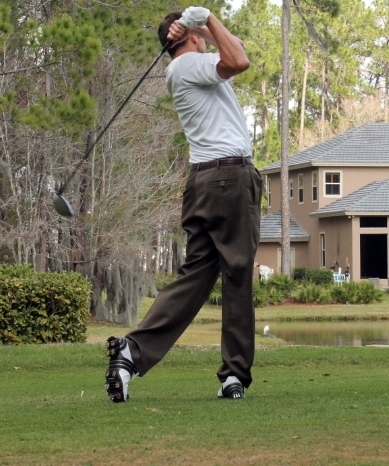 The one golfer that didn’t surprise me with his swing was former Rays SP/RP and new Cub Andy Sonnanstine. Maybe it was the fact I was just off to the right of the tee box about 150 yards, but Sonny actually stroked one within 10 feet of me just shy of giving me a bruise to remember. I even saw one golfer do a “Happy Gilmore” approach and nail a ball a good 140 yards while his grandson did more damage to the tee than the white Rawlings ball. Still you get the jest now that this tournament takes it focus seriously but while on the links talks, bonding and bringing together people who want to support these charities is priority one. Fun might rule the day, but serious matters including some high bidding on packages and auction items ruled the roost after everyone was done for the day on the greens. 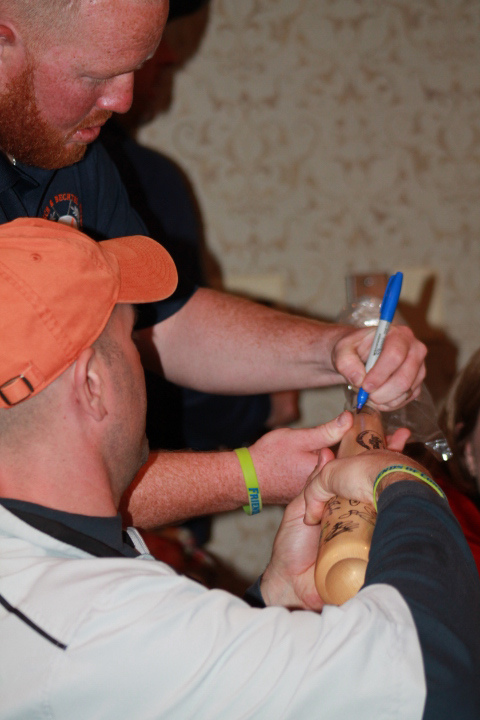 Again there was the autographed bats signed by each celebrity participant of the tournament that this seasoned peaked out at $ 250 each bringing more help and financial muscle to the charities. 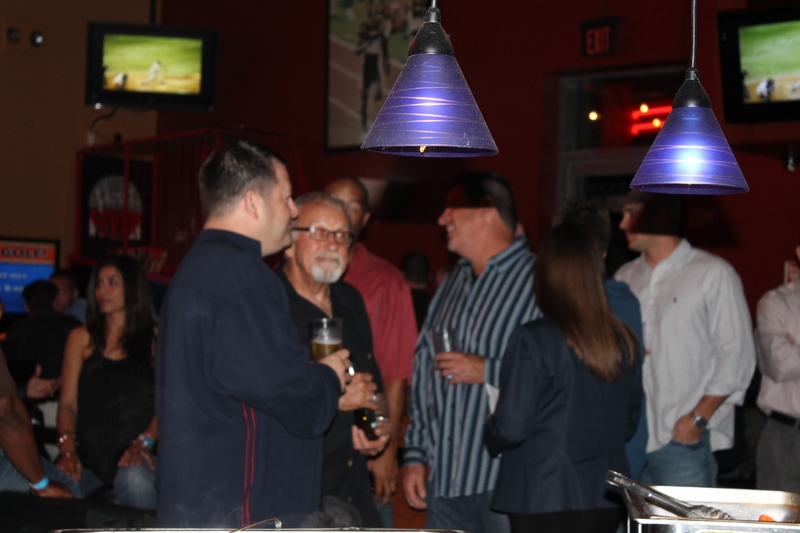 All the whole there was an assembled hum and buzz in the room as everyone talked either about the upcoming baseball season, their daily good and forgettable moments, or just wanting to meet and bond with their table mates. Charlie Belcher from the local Fox affiliate again was the Master of Ceremonies and did a great job as usual bringing together the assembly at the right moments to honor the day’s best golfers and offer some great comedic moments. I was glad I detoured myself this season out onto the golf course. There was different vibe outdoors even with the cold bit in the air, the humor, and relaxed attitude of each of the pairings as we crossed paths was inviting and a great experience. This is definitely one of those I want to volunteer my services to as long as possible, for their outreaching arms to the community is inspiring, and it is great to see a local MLB player and a heavy hitter in the financial field give back with an equal amount of rejuvenated vigor and vitality. In the end I want to again thank Jesse, Kevin, George and the entire participating group from organizers, volunteers and participants for again bringing a warmth to my heart with their outward display of great giving back to this region. You can bet without a doubt I will be back in 2013, just save me an opening, because I am ready, willing and able to again participate in such a great charitable adventure. Bloggers’s Note: I want to apologize to Jesse and Kevin for the delay of this post. When my laptop went down, I was afraid I had lost these photos, but I was able to pluck them from my dead hard drive and also post other photos to my free Flickr photostream. Again thank you for the memorable moment and I truly look forward to the 2013 edition of this great event. Professional athletes have a special format and platform to help educate and introduce us to charities and organization that are among us that without their support or enlightenment might go unnoticed or suffer financial downfalls and possible extinction. 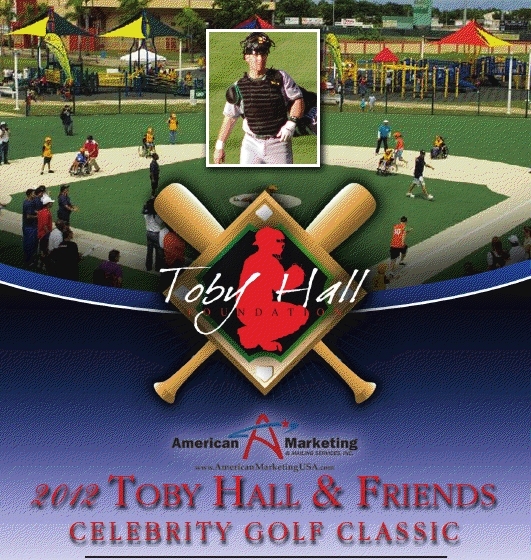 This is one of the many reasons I have chosen to be a part of the annual Toby Hall and Friends Celebrity Golf Classic. 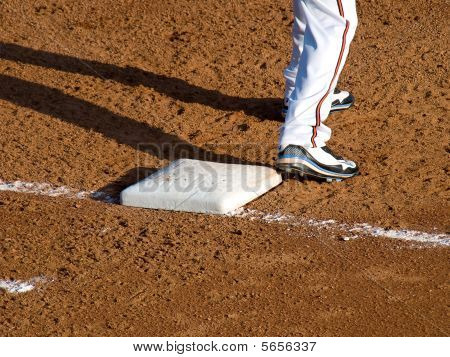 Well, that and helping out one of my true baseball friends. 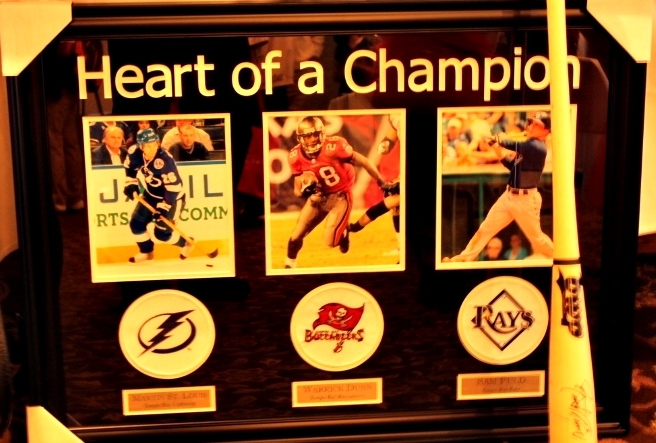 His 2012 event again was overflowing with support from the baseball and sports community of Tampa Bay. 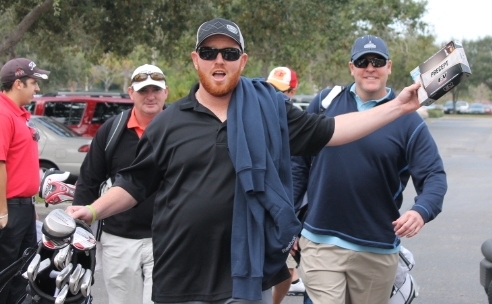 From the Tampa Bay Lightning to former and current athletes coming together to help support Hall and The Miracle League, the event was a winner from the arrival of the first golfer. This year the event took on a different feel for me. Hall had announced his official retirement as a player earlier in the year, and now his focus and determination was focused and pin-pointed towards helping those organizations that touched at his heart strings. I also took on a different face within the classic this year as I was on the opposite end of the camera lens taking photos of some of the golfing pairings, and getting some unseen shots while accompanying Hall and his entourage around the course during the days events. It was great to see former Tampa Bay sports icons like Tampa Bay Bucs RB Mike Alstott, T E Dave Moore, K Martin Gramatica. 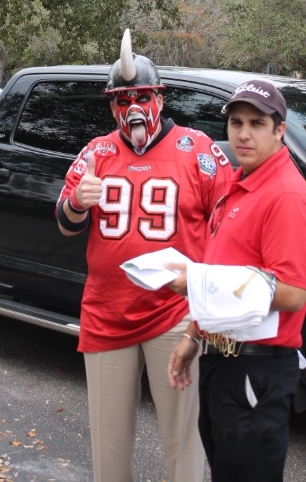 and the Bucs mega fan Big Nasty made the region’s football presence known at the event. 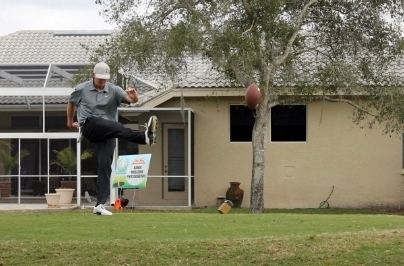 Other NFL participants were Kansas City Chiefs TE Anthony Becht and former Jets, Bengals and Bucs OL Matt O’Dwyer. As usual, the Major League Baseball community both in Tampa Bay and with a bevy of former Rays made the bulk of the events celebrity attendees, each bringing their own spin and special moments to the event. 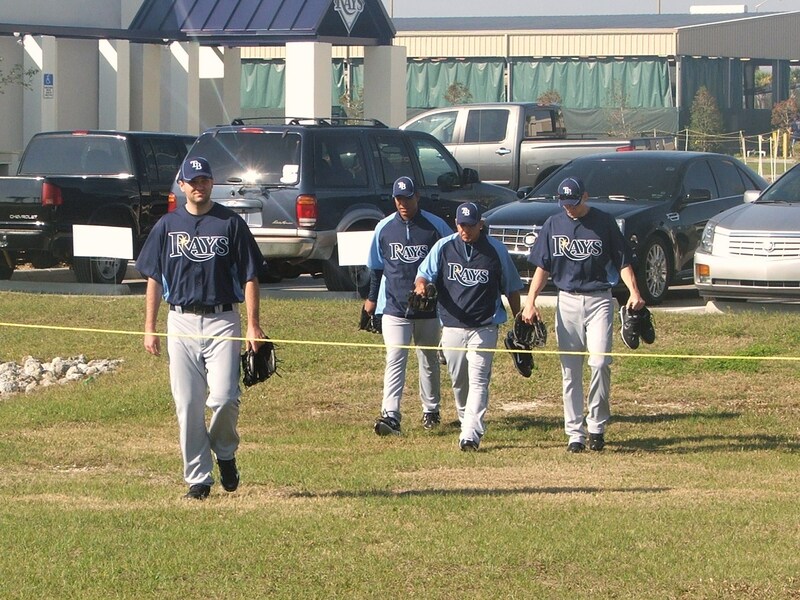 Current members of the Rays showing their support for the former Rays backstop included SP David Price who formed Team Price along with teammates SS Reid Brignac and CF B J Upton. 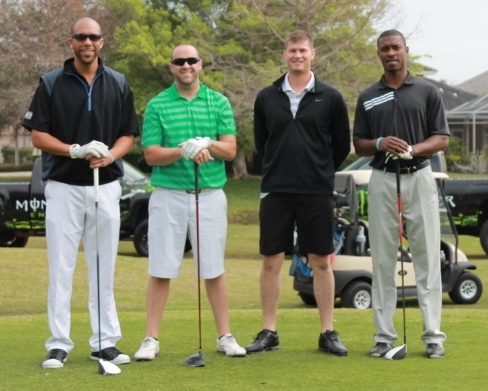 Also attending the event was SP James Shields, Jeremy Hellickson, Alex Cobb and RF Matt Joyce who all acted as celebrity golfers in the classic’s pairings. But Rays players were not the only one having fun on the links this day, Rays Third Base Coach Tom Foley, former Pitching Coach Chuck Hernandez, Bench coach Bill Evers, former Rays Hitting Coach Steve Henderson and former Rays OF and current Montgomery Biscuits Coach Ozzie Timmons made their rounds Thursday. Former Rays bat boy and current Toronto Blue Jays P Jesse Litsch was also on hand as well as FSN Sports and Rays Television broadcast man-on-the-move Todd Kalas who came out to support the event plus performed some spontaneous Awards Dinner MC work that inspired the evenings auctions. Several other former Rays and long time supporters of the classic which included a pair of new Chicago Cubs, LHP Trever Miller and RP Andy Sonnanstine, plus new Indians RP Dan Wheeler who made their annual show of support for their former teammate. Former Rays backstop Gregg Zaun again brought his humor and great vibe to the event along with Washington Nationals OF Jason Michaels who again brought his unique putter and local radio “babe” and original Hooters icon Lynne Austin who I still owe a Bloody Mary. 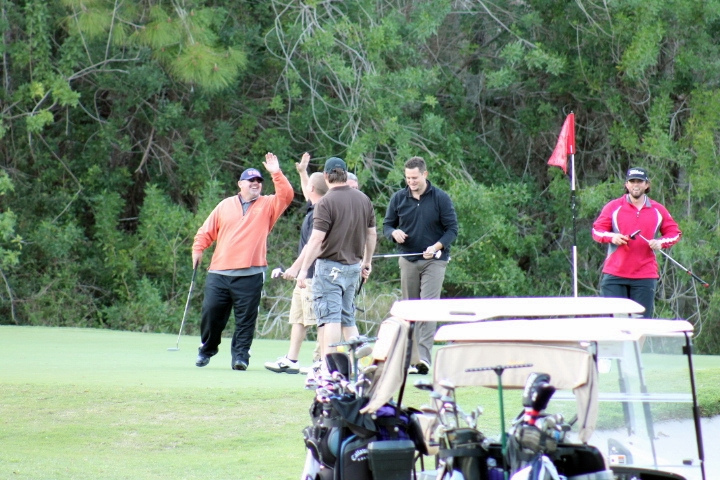 Local NBA icon and restaurant owner Matt Geiger also showed his tall and big presence on the links. It was a great day on the greens and fairways and I had a great time talking and shooting the breeze with many of the celebrities and amateurs who took to the links. With great weather and great bonding on the golf course, the night’s final event brought the whole day to an eventual climax. Along with the raffles and awards presentation, Hall then introduced a group that had touched more than his heart strings to the assembled crowd. Hall spoke of his recent introduction to another great baseball related group called Buddy Baseball that pairs a volunteer with a special needs player and they bond both on and off the field. 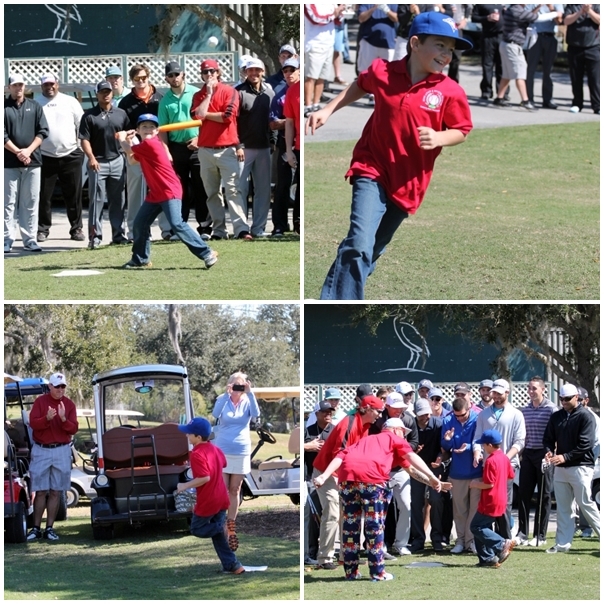 His emotional moment touched so many in the crowd, and showed us another great organization to not only keep an eye on, but help develop into the successful model The Miracle League has become around the Tampa Bay area. Hall presented the group with a $ 4,000 check on this night, and with it came a rush of emotions all over the room and with the players and staff. So many of the works and events that athletes do both in Tampa Bay or around the country do not get their “just desserts” within the local media. I volunteer for these events every Spring not to glamorize the athletes involved, but hope to inspire and promote others within the region to also join the path to helping these organizations have continued success and expansion into other Tampa Bay regions. 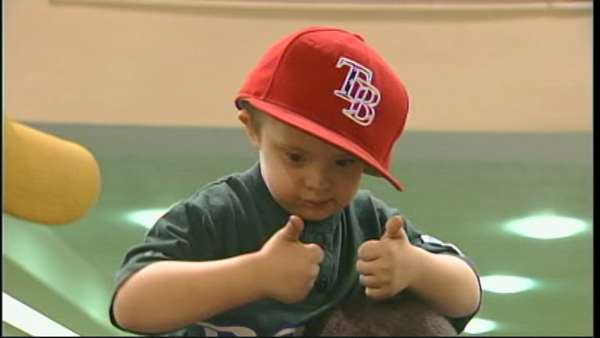 Knowing that Hall has included the Baseball Buddies group now with The Miracle League charity it is a great moment for special needs kids and adults around the Tampa Bay area to have that unique baseball experience and enjoy the game. I will be posting all my additional photos of the 2012 Toby Hall & Friends Celebrity Golf Classic on my Flickr page (Rays Renegade) if you might desire to re-post or download a photo for your own. 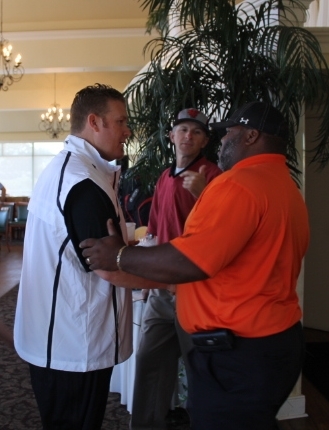 It was suppose to be a pairing party in advance of the 2012 Toby Hall and Friends Celebrity Golf Classic. It was suppose to be one of those meet and greet opportunities for the duffers to meet other members of their foursome, and also celebrate another awesome tournament. That was the plan Toby Hall had in his mind before he entered the Courtside Grille last night. 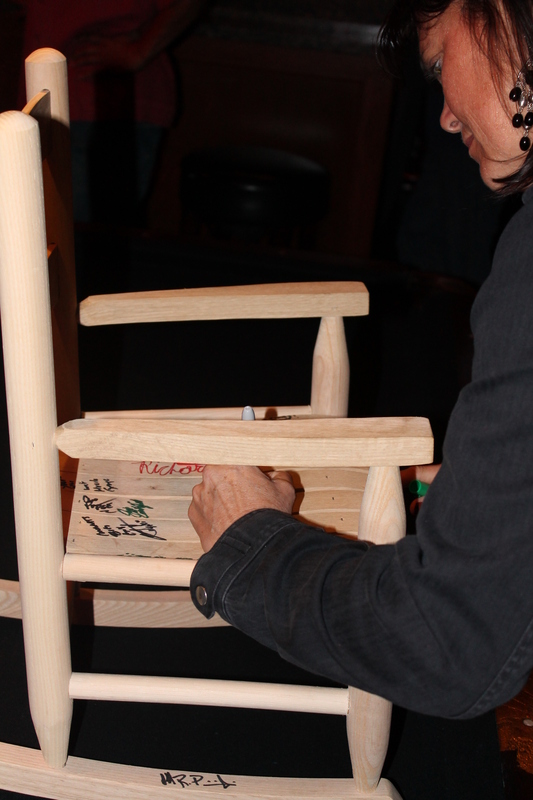 Instead it became an impromptu Retirement Party complete with the obligatory pine wooden rocking chair that party invitees were asked to sign and give their well wishes to Hall as he embarks on other adventures in his post MLB life like watching his kids grow up, and devote more time to his charity and other worthwhile endeavors. It was an event I did not want to miss. There were people coming out of the proverbial woodwork for this honor like former Rays owner Vince Namoli who looked very relaxed and had even lost a few pounds. Former Rays Pitching Coach Chuck Hernandez came to the event as well as former Rays Bullpen Coach Glenn Ezell and current Bullpen Catcher/Enforcer Scott Cursi. The showing of support from former players on a night usually reserved for the menial task of assigning pairings was a complete success. In the crowd was also former Rays OF Randy Winn, Toronto Blue Jays Pitcher/ Rays Bat boy Jesse Litsch, hurler Boof Bonser and Tampa Bay Bucs Defensive Back Ronde Barber. On the screens around the bar played a photo montage of Hall’s days both at Triple-A Durham, Tampa Bay and his stint with the White Sox. Food was plentiful, drinks were flowing and the room held a great vibe of well wishes and a few well placed cards and present for Hall and his family. As the pairing were being announced, it was immediately noticeable that this season’s tournament had a few extra Rays names being bellowed out like P David Price, James Shields, Jeremy Hellickson, SS Reid Brignac, CF B J Upton, RF Matt Joyce along with Rays farm Coach Ozzie Timmons, Jason Michaels and the always entertaining Gregg Zaun. Former Rays RP Trever Miller, Dan Wheeler Andy Sonnanstine, Rays Coaches Tom Foley and George Hendricks plus that strapping young lad, FSN Florida/Rays traveling ambassador of good times Todd Kalas. The event seems to have exploded this season with the addition of several Rays player who will be first time attendees this year. The show of great support for Hall and his main charity, the Miracle League should make this the best tournament turnout and fundraising in the Toby Hall Foundation’s history. It was a great time to show our admiration and respect for a player who gave his all for the Rays, and is still considered the best to ever squat behind the plate. Hall may be leaving the game a bit earlier than he expected, or wanted, but his foundation, his children and his wife will be more devoted attention. 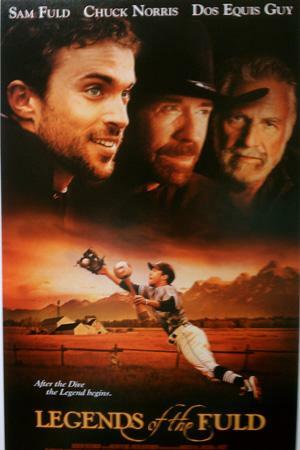 If Hall takes to his retirement that way he called games and hit at the plate, then he will again be hitting for the fences. Go get ’em Toby! This is one of those times that Major League Baseball players who are within the salary arbitration process either dread or look forward to with glee. 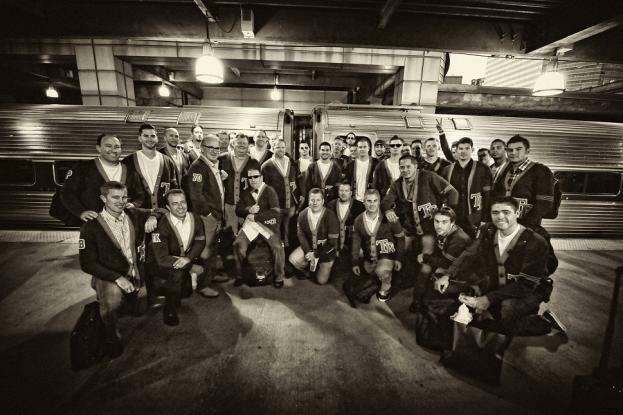 It is the time that their clubs either shower them with confidence and acknowledgment Spring. 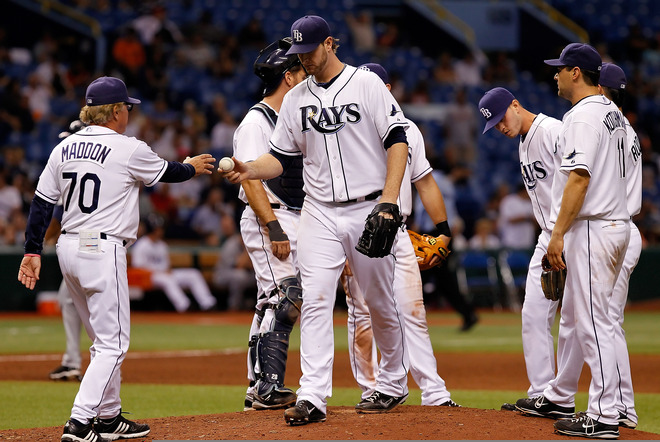 The Tampa Bay Rays are no different, they will have to decide within the next 24 hour period who is worthy, and who has put on a Rays jersey for the last time. 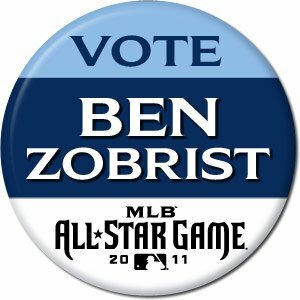 You might think the process is easy, but with 6 players et to enter the arbitration pressure cooker in this 2011 off-season, I truly think only half of this group which includes LHP David Price, CF B J Upton, RP Joel Peralta, RP/SP Andy Sonnanstine, SP Jeff Niemann and former closer J P Howell can rest easy. Two of this group could be non-tendered on Monday, while a third could possibly be tendered with a quick resolve to trade them before the arbitration process unfolds this Spring. Only Peralta seems on completely sturdy ground with an impressive 2011 campaign, and an estimated $ 2 million arbitration salary. 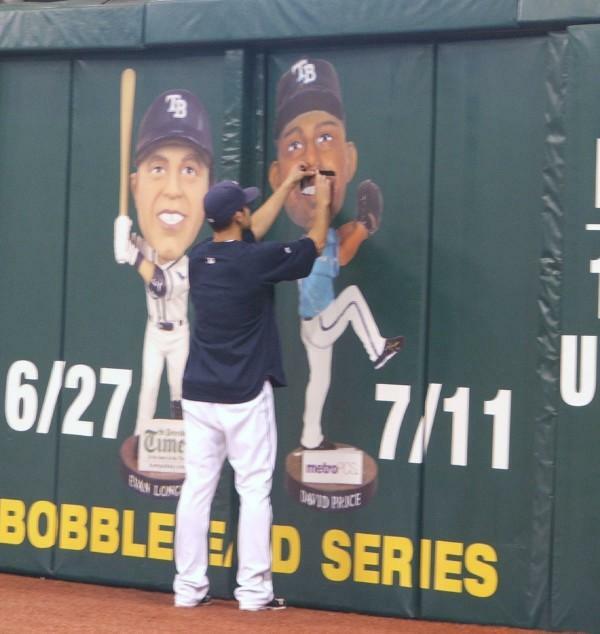 A great set-up man like Peralta would easily set the Rays back possibly double what Peralta could get in arbitration, and that makes him a safe bet to be with the team this Spring. Instantly members of the Rays Republic will be scratching their heads wondering if I had taken a hallucinogenic or have lost my friggin’ mind because I did not include the Rays ace, Price in this category. I would think the team is already in closed-door discussions with Price and his agent possibly trying ti iron out an extension, or possibly a viable financial situation that would keep both Price and the Rays smiling beyond his arbitration years. 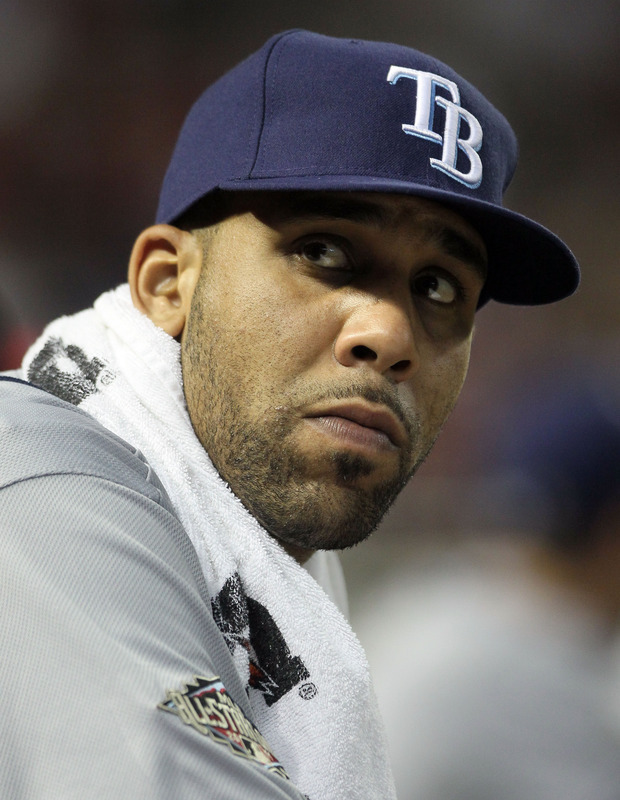 Price has always been a “team-oriented” player, and if he and the Rays can come together on an extension, then we could see Price blossom in a Rays jersey for a long time. If not, some team would unload their farm system for a guy who is still evolving and is a left-hander. 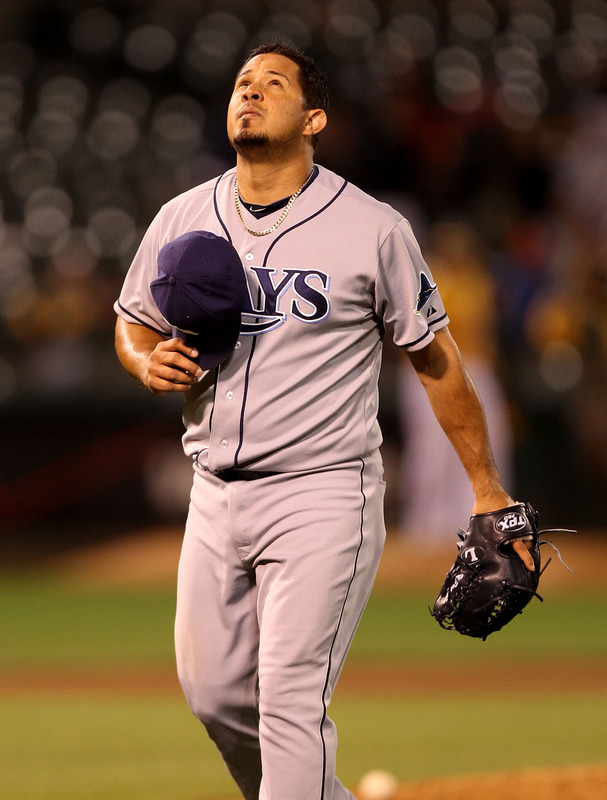 With an estimated $ 7.8 million salary for casted via arbitration for Price, without some sort of unilateral agreement between himself and the Rays, his future will become cloudy within the next 2 seasons, which would be a shame for both sides. B J Upton is another guy who could easily vault past the $ 7.5 million hurdle with estimates ranging from $7.4-7.6 million for the Rays versatile CF. 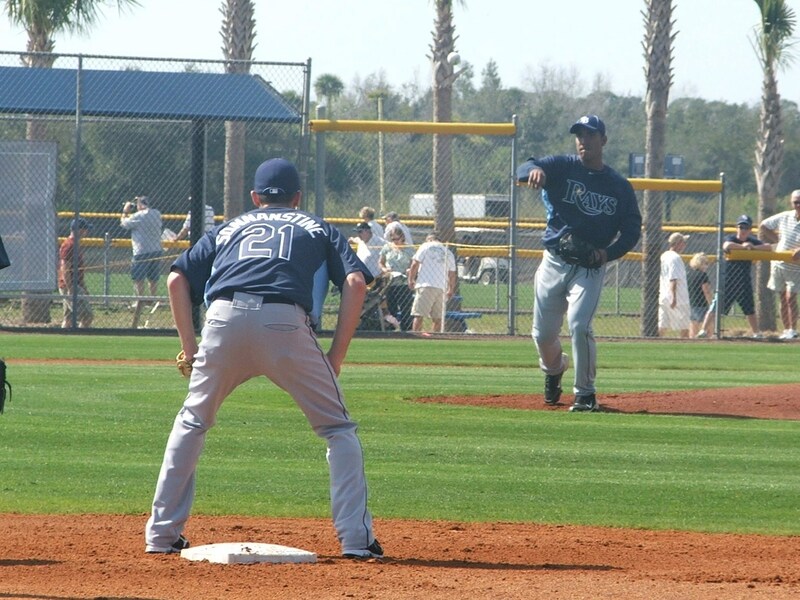 Upton is one of two players currently in the Rays arbitration process who could see himself being offered arbitration, and possibly be dealt before the team reports to Spring Training in Port Charlotte, Florida in mid-February. Still, Upton has the unique distinction of being “affordable” by Center fielder’s price points, but with several emerging candidates, including Sam Fuld or Desmond Jennings already bursting through on the MLB level, Upton has to feel he is not on stable footing. 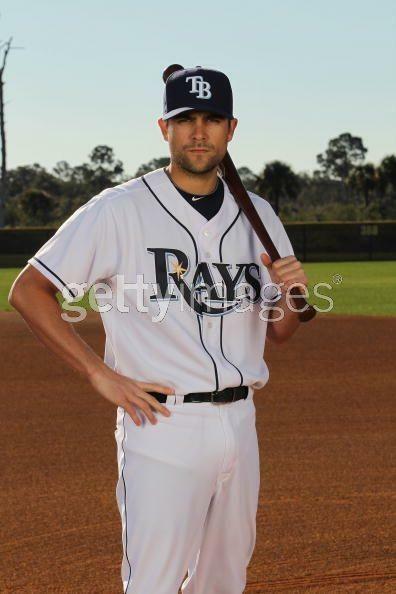 The other player who could have pulled on a Rays uniform for the last time is RHP Jeff Niemann. 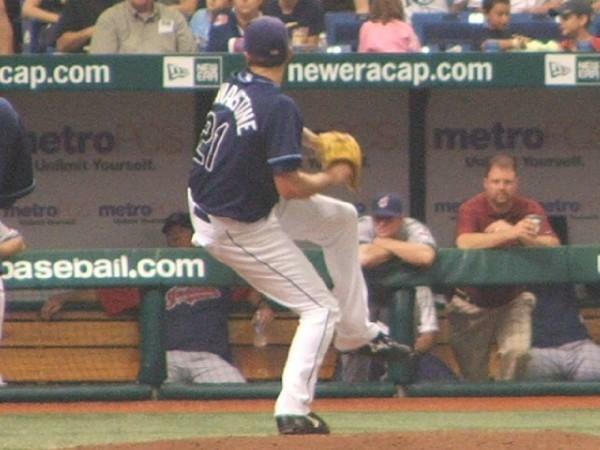 Even though Niemann could only cost an affordable $ 3.1 million through arbitration, the Rays have a budding stable of pitching ponies behind the Tall Texan, and his health concerns and in juries over the past two seasons could make him an instant trade candidate and the least likely player to still be with the team this Spring. 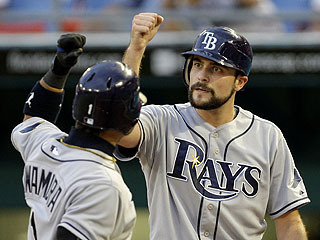 Even though the other “silent assassin”, Wade David is also being mentioned in trades chatter, Davis has an extended contract with the Rays already in hand and that makes his situation more stable compared to Niemann. The Rays could still offer arbitration to Niemann knowing they will also explore trade situations and possibly use his salary arbitration as a key point in their trade talks, maybe even including a minor league prospect or money to another team to take Niemann. So far on the arbitration forefront we have seen a “sure thing” and another arbitration eligible player who can be included in that category, but who might become expensive in the next 2 years. Also we have explored 2 players who might be on the top shelf of trade chatter, and who could even with salary arbitration attached to them be dealt even before their Spring hearings. Also to consider either of these 2 players could also be involved in a sign and trade situation giving their new squad a bit of financial relief, Niemann seems to be the one definite player on the cusp, but he has value on the trade front, so arbitration might be in the cards on Monday for Niemann. 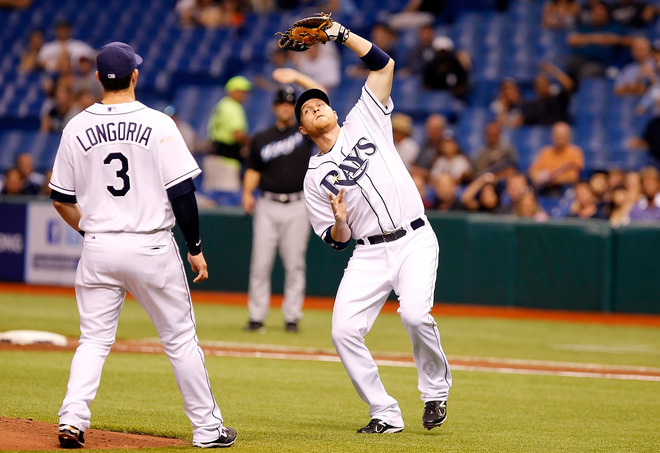 There are still two player who might have pulled on their Rays uniforms for the last time, and it hurts me that both are baseball friends of mine. 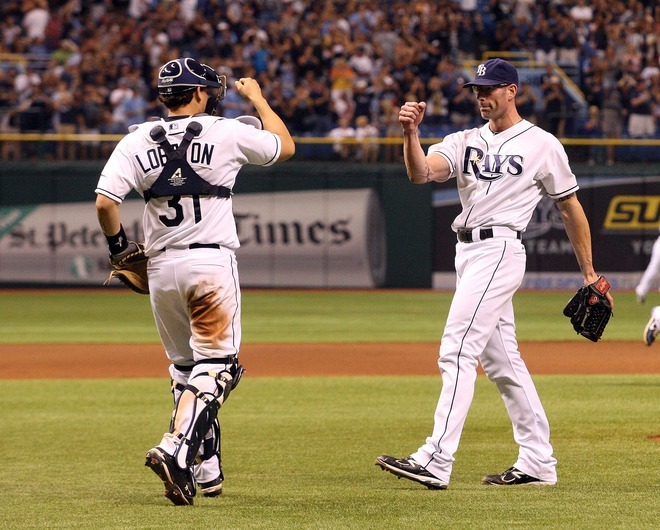 Both of these guys have sweat bullets for the team and been “company men” for the Rays enduring heartaches, surgeries and even unexpected trips away from the Rays that might have secured their destiny. 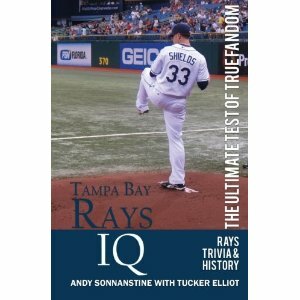 Andy Sonnanstine has done everything ever asked of him by the Rays, but with most of the 2011 season in “arbitration purgatory” with the Triple-A Durham Bulls, Sonny might be an easy candidate for the Rays to non-tender. 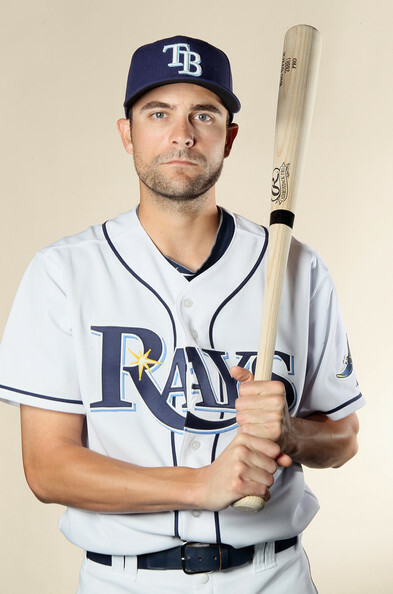 This is a guy who has been comical, serious and multi-dimensional his entire Rays career, but with the current young guns pushing the ceiling for a shot in the majors, Sonny might be expendable. Even his affordable $1.1 million arbitration estimate might be more than the Rays would be willing to fork over for middle-of-the-road starter/reliever with the huge surplus of young talent on the cusp of being MLB ready. 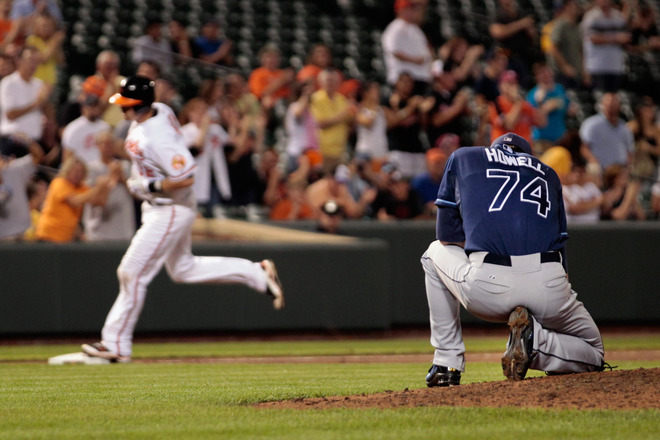 This pains me, but LHP J P Howell took a huge step backwards in 2011, and that could cost him more than money. Sure he was trying to get back into the seasonal flow coming back into the Rays Bullpen towards the middle of the season, but his numbers and velocity took a tumble even with his mechanics at times plaguing his performance. His favor is an affordable $ 1.4 million estimate for his arbitration, and that could possibly push him over the hump and get an arbitration offer from the team. But you have to consider Howell has stiff competition this Spring with fellow southpaws’ Jake McGee and Cesar Ramos again manning the hill for the Rays. It might come down to the intangibles like leadership, potential and if Howell can regain his velocity and trickery in 2012. 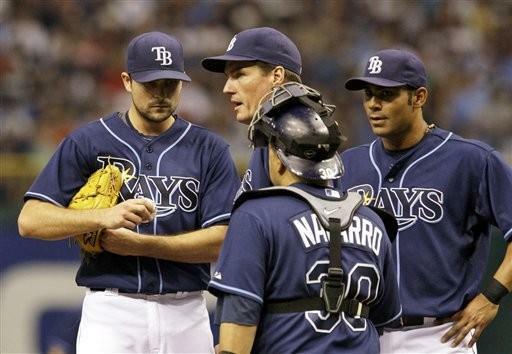 You have to think an entire off-season to prep and regain his command and composure would benefit Howell, but could it be too late to impress the Rays brass that he will come back stronger in 2012. I would love to see all 6 eligible players get a chance to go through the arbitration process for the Rays this Spring, but the numbers might not support such a move. 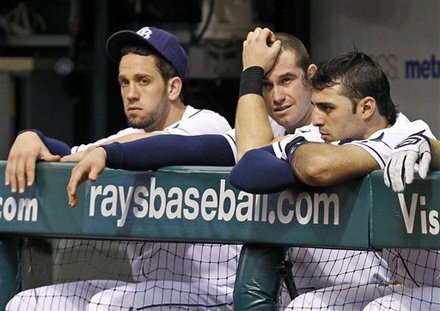 With an early estimated $ 52.1 million payroll for 2012 with arbitration eligible figures included, that poses a 27 percent raise in the Rays payroll projections, and possibly 11 players topping the $1 million salary mark for 2012, any of these 6 arbitration eligible players could be gone to further lower the projected payroll before a single free agent to signed. 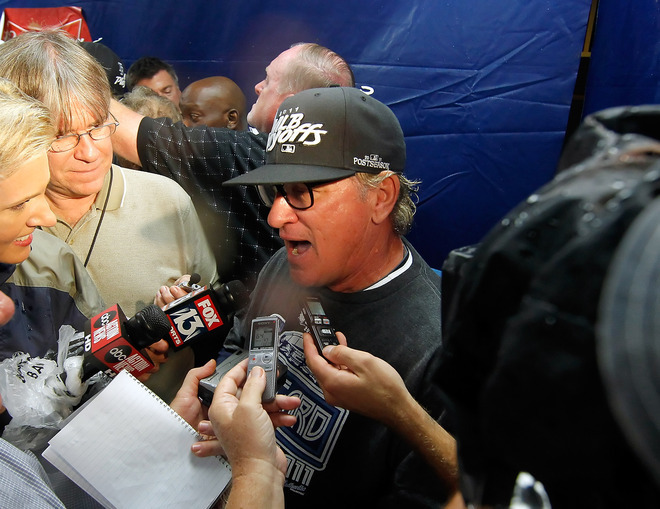 This is a critical year for the Rays with the Boston Red Sox’s recent contemplation of staying under the luxury tax threshold in 2012, and the possible addition of a second American League Wild Card spot anticipated, and all financial decisions on Monday could play into the Rays final position come the end of September. The arbitration process has a way of being cruel or kind depending on your position at the end of the day, but it is a viable way for teams to keep themselves solvent and reduce personnel during the off-season. Peralta, Price and Upton should be on terra firma on Monday while Sonnanstine and Howell might be chin-deep in a puddle of quicksand without any rope or long branches to save them. Still, the one player who might be in the most vicarious position might be the 6′ 9” Niemann. 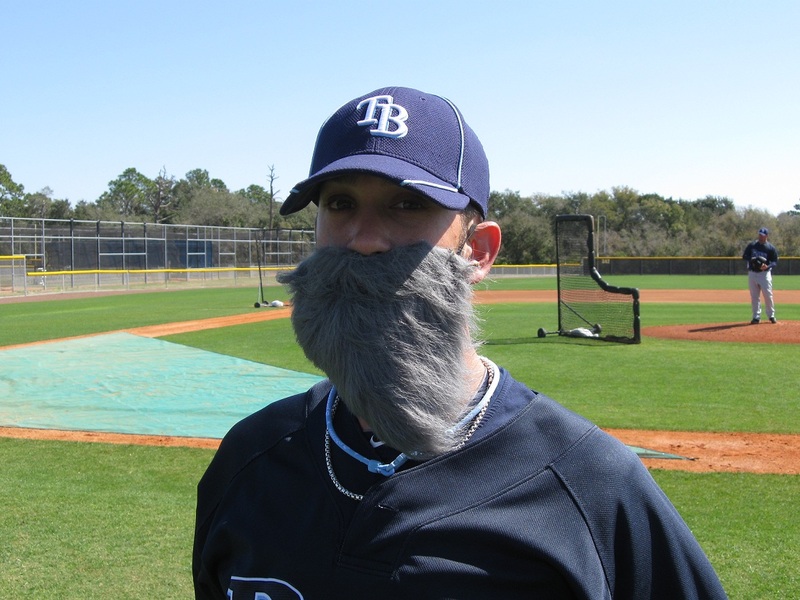 He has the ability but not the sustained health for the Rays to confidently say without a hint of remorse he should get an arbitration hearing. 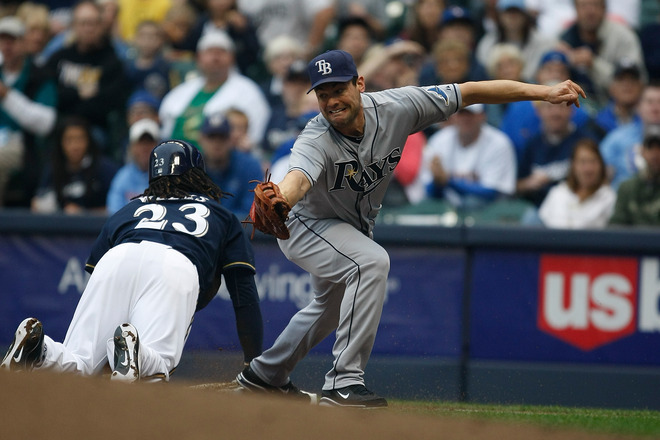 Niemann will certainly get a hearing, but it might be a precursor to his eventual trade from the Rays. No matter what happens on Monday, these 6 players have brought instances of joy and memorable events to all of us in the Rays Republic and I hope not matter what the outcome they know they will always be Rays in our eyes. 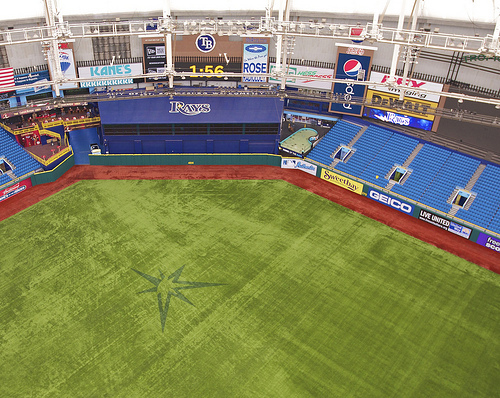 Thank goodness the Rays do not have upwards of 10+ arbitration decisions that teams like the San Francisco Giants (13), Oakland Athletics (10), San Diego Padres (11) and Red Sox (10) on Monday. 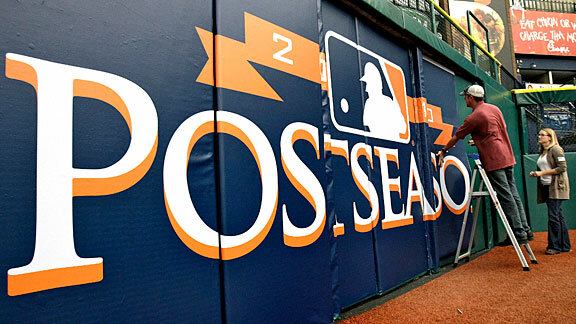 Those arbitration decisions could dissect half of their roster in one day. Talk about a stressful day.